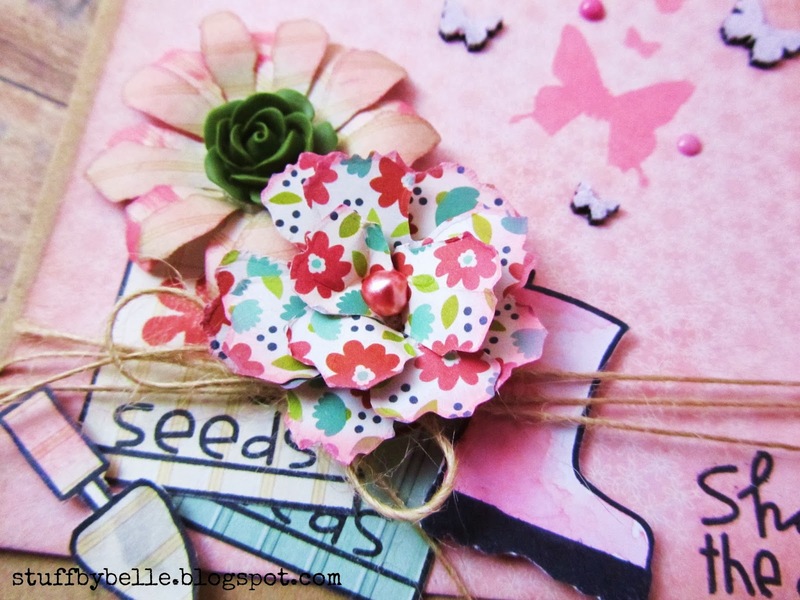 Stuff By Belle: Hello SPRING! This week we are saying 'Hello SPRING!' 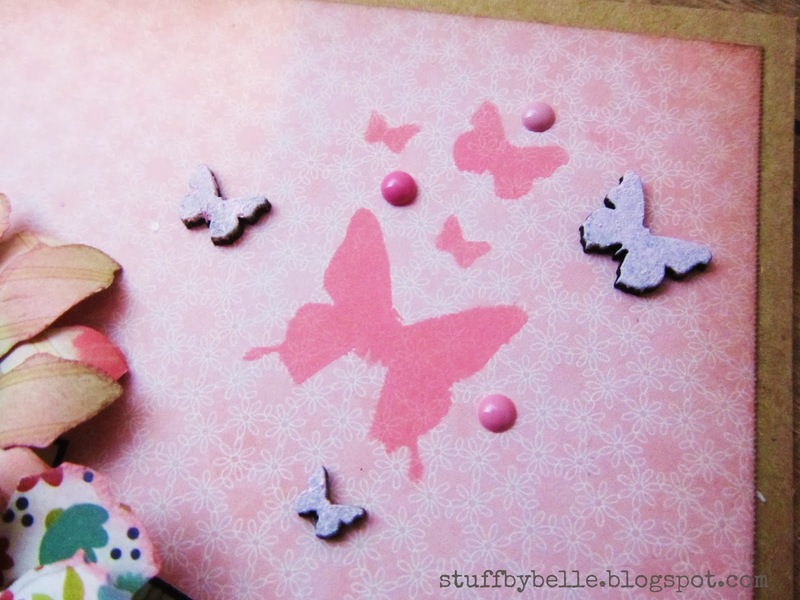 over at Cuttin' and Stampin'. I am not sure where in the world you are but here in the Midwest we have had enough of winter, so I for one am wishing for spring. We are using Pebbles Front Porch collection and Paper Smooches Green Thumb, both of which you can find at the Cuttin' and Stampin' facebook store. I am sharing a card I made to send to a friend of mine I haven't heard from in a while...we will have some catching up to do. I used Distress paint in Worn Lipstick and Spun Sugar with an UmWow Studio mask, on UWS chipboard, splattered on my flowers and to watercolor paint the fussy cut rain boot. I cut my flowers with Tim Holtz tattered floral dies, scattered some Doodlebug sprinkles, tied some May Arts burlap twine and VIOLA! Hello SPRING! The flower centers are a Fancy Pants resin rose and Perfect Pearls. To me butterflies = spring, how about you?? 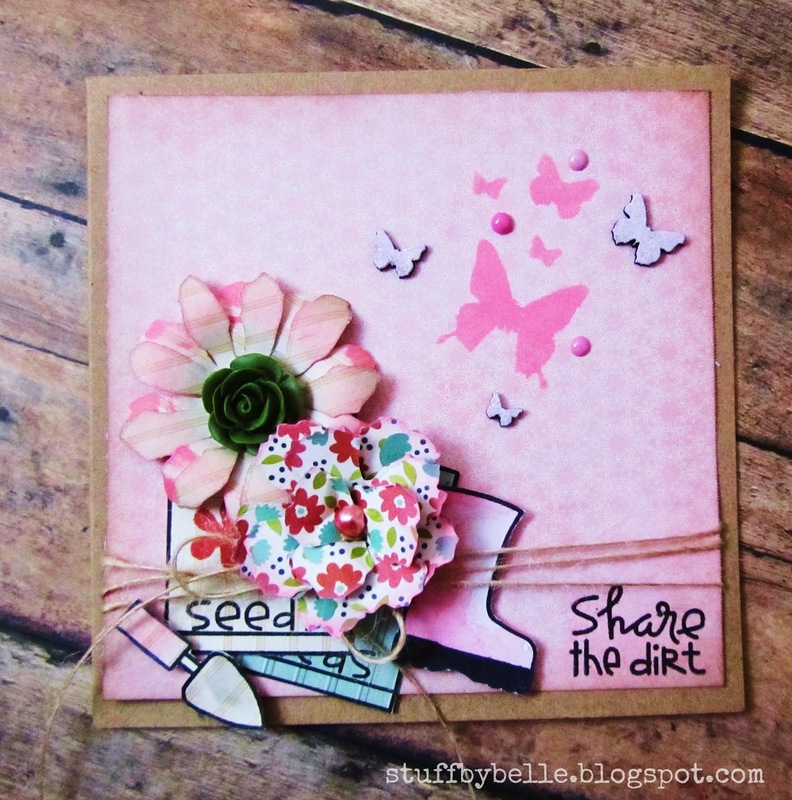 Make sure you head over to the challenge blog and link up to this weeks challenge for a chance to win some fabulous scrappy goodness!! Thanks for visiting and until next time...get inky often! Oh wow this is so beautifully designed. Love the layering of the elements. Very pretty! Love the butterflies! Love! The little seed packets and boots and the cutest touch to it! Such an awesome card. Thanks for all your hard work.